A while ago, the Boston Center for Adult Education (BCAE) contacted me to see if I would be interested in auditing a course at the center. Of course I jumped at the chance. I have been hearing amazing things about their classes for the last year now, and just hadn’t gotten around to testing it out myself, so now was the chance! I had a very hard time choosing which class to take. My first choice was to attend one of the celebrity chef “Behind the Line” series…I know, such a cop-out, but they are amazing! Naturally though, the class was already sold out. 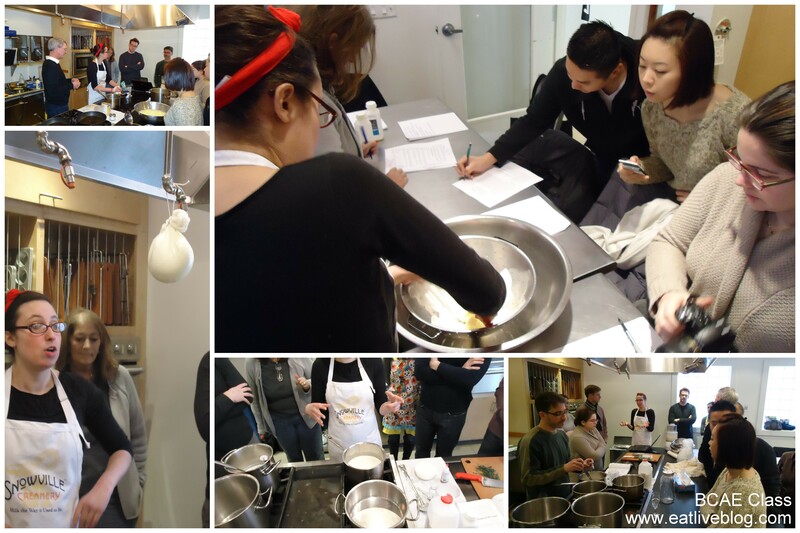 Next on my list was a beginners Cheesemaking class being offered on a Sunday from 10am – 1pm. Luckily, that class was available and registered I was! I don’t know why, but for some reason I had a picture of a run-down community center in my head when I pictured the BCAE. What I did NOT envision was the state of the art facility that it is. I think I may have repeated, several times, how impressed I was. Jessica talked for several minutes on the cheese making process, milk, the pasteurization process, and the chemistry behind cheese making. And some how she managed to make it fascinating, which can’t be easy to do. After the initial “lecture” session, it was all hands on deck! First up was butter. Do you have any idea how easy butter is to make? Why on earth didn’t I know this sooner? Literally, all you do is pour some cream in a food processor and let it go until it separates. Pour it into a butter muslin (which is like cheese cloth but with smaller holes) lined colander, press it down to release the moisture, put the remaining butter in wax paper and knead in a little salt and voila! Butter! 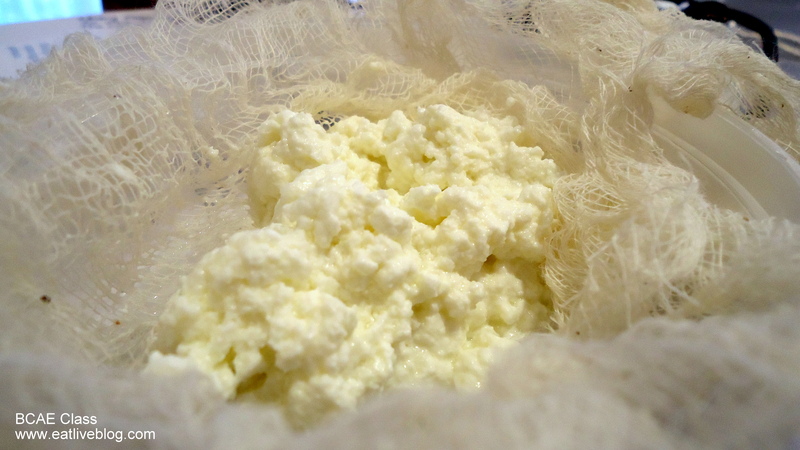 Next up we made ricotta. Once again I ask, how on earth did I not know how easy this is?! Pour a gallon of whole milk in a large pot with a little lemon juice or vinegar, SLOWLY bring it to 180 degrees while slowly stirring (its all about slow). When it hits 180, you should see the curd starting to form. Pour the mixture through a cheese cloth lined colander. 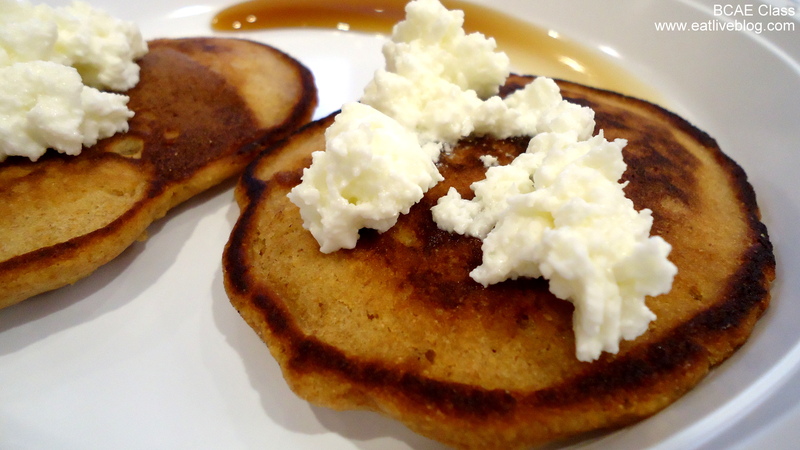 Let drain for an hour….I may have just eaten the ricotta right away…. 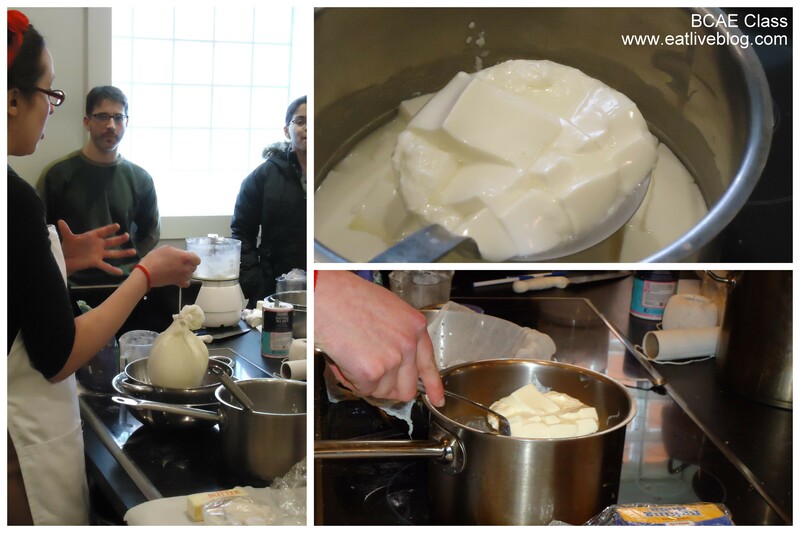 Jessica also had us demo how to make cream cheese and yogurt. Sadly those have to sit for longer periods of time, so we were un-able to sample these fruits of our labor. …and yes, we did all taste the whey as well. Which wasn’t gross like you would think. It actually was pretty good, like a glass of warm milk. I know, even typing about it grosses me out a little, but it did taste good! We did not leave our class empty-handed either. 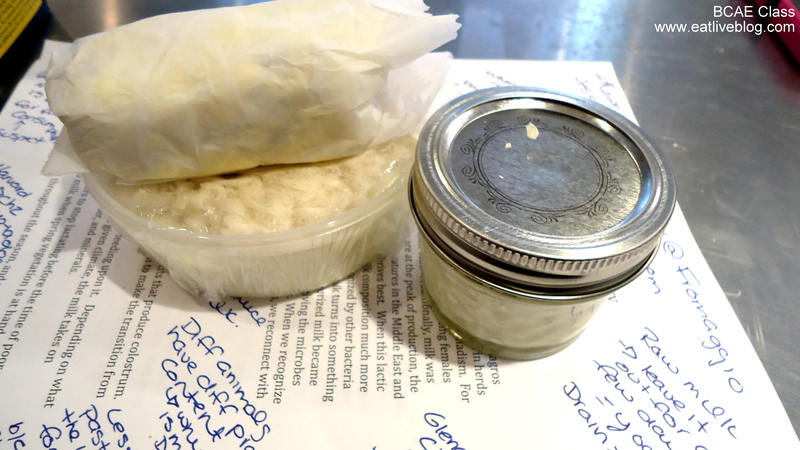 We took home the ricotta and butter we made, as well as a small yogurt to use as a starter for our own batch at home. Pretty cool. The classes at the BCAE are not “cheap”. This class would have cost $60 + $20 materials fee. However, you would definitely get your money’s worth for that $80. Jessica was a very high-caliber, knowledgable professor….and she was fun! We made several different items and had take homes. Not too shabby! 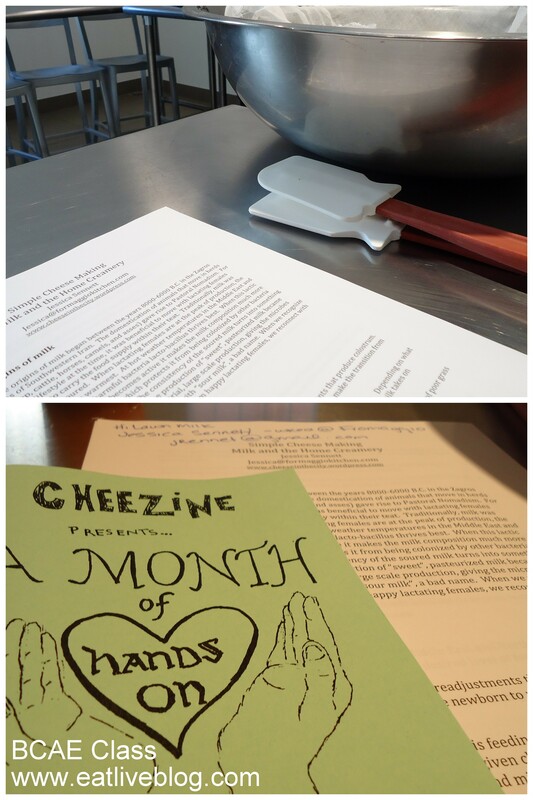 This entry was posted in Reviews and tagged adult education, BCAE, boston, Boston Center for Adult Education, cheese making, class, Classes, Jessica Sennett by reneeh. Bookmark the permalink. What a fun class! I love making butter and I’ve made ricotta once. I agree, the BCAE space is pretty great. 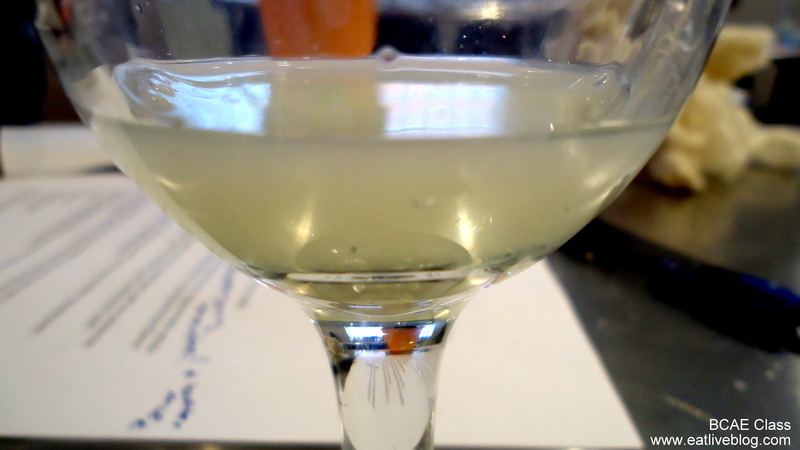 I’ve taken a really fun cooking class at the BCAE before and had a blast. It looks like this was a great class! That sounds like such a fun class. 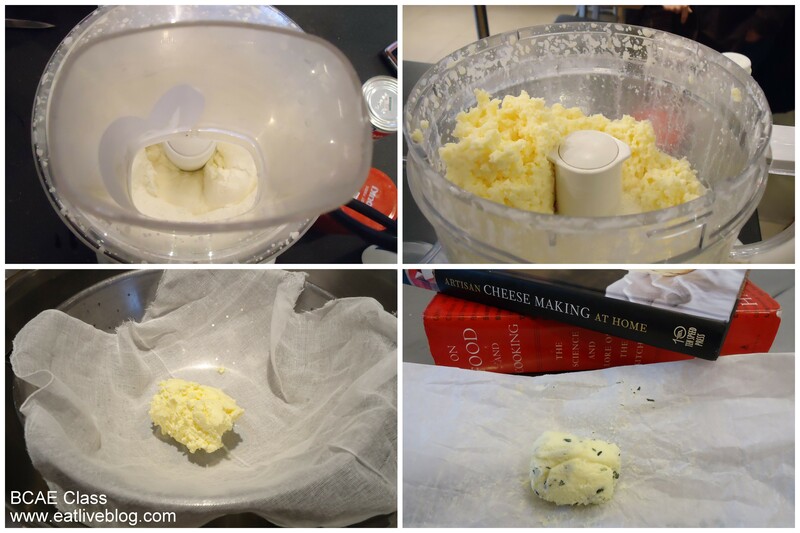 Have you made any cheese at home yet?! I’ve never been disappointed with a class I’ve taken at the BCAE. This is one class I need to take!